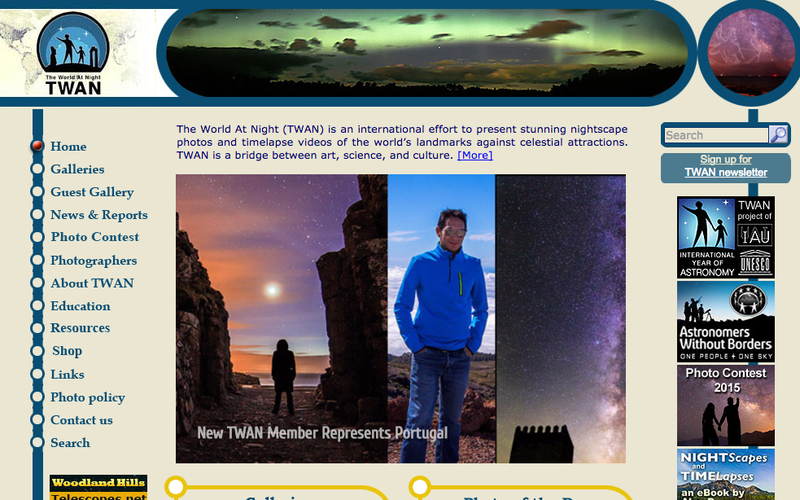 TWAN The World At Night is an international effort to present stunning nightscape photos and timelapse videos of the world’s landmarks against celestial attractions. TWAN is a bridge between art, science, and culture. This international project have now a new portuguese photographer member representing Portugal, Miguel Claro. The World At Night (TWAN) is a program to create and exhibit a collection of stunning landscape astrophotographs and time-lapse videos of the world’s most beautiful and historic sites against a nighttime backdrop of stars, planets and celestial events. TWAN is a bridge between art, humanity, and science. The eternally peaceful sky looks the same above all the landmarks and symbols of different nations and regions, attesting to the truly unified nature of Earth as a planet rather than an amalgam of human-designated territories. Those involved in global programs learn to see humanity as a family living together on a single planet amidst the vast ocean of our Universe. This global perspective motivates us to work for a better, more peaceful planet for all the world’s inhabitants. Astronomers Without Borders was created to work toward this goal. TWAN is an innovative new approach to expanding this global perspective. TWAN-style Earth and sky photographs are being taken by some of the best landscape astrophotographers around the world. The resulting collection of nightscape photography is presented in an international traveling exhibition and in a virtual exhibition on the TWAN web site. TWAN is bringing together photographers, astronomers and organizations worldwide to create a new international team. That team full fils TWAN’s primary goal of bringing to the public a new way of seeing the wonders of our planet by portraying Earth’s people as one family and our world as a living planet we must care for. PT: O Projecto internacional TWAN The World at Night, tem agora um novo membro representando Portugal. O astrofotógrafo português Miguel Claro, fotógrafo oficial do Dark Sky Alqueva, é o membro mais recente do projecto que reúne algumas das maiores referências da astrofotografia mundial.